Today I'd like to talk about FEAR. There's so much of it out there now. Fear of the economy. Fear of Swine Flu. And most importantly, Fear of Success. It's amazing how fear can hold us back from getting what we SAY we want. Fear is like your best friend. The one who made fun of you behind your back in grade school, when you did nothing about it. You were afraid of confronting fear then, and you might be afraid now. That which we fear the most can hurt us the most. The fear of success is very real. I see it daily. Sometimes I even see it in my bathroom mirror. * Sometimes we fear success because we know we have work to do that may force us out of our comfort zone. That's scary. I don't want to do it. * Sometimes we fear success because we may actually have to live up to who we said we would be. You mean I have to perform now? What if I'm not smart enough? * But most of the time we fear success because we are lazy. We want success to come easily. We want the shortcuts. We want someone to hand us the key. Real success comes with real effort. Do the work, earn the reward!!! What are you NOT doing that could take your business to the next level? What are you afraid of? This coming week, I want you to get out of your own way. One way to do this is to do more networking and get comfortable making new business contacts. 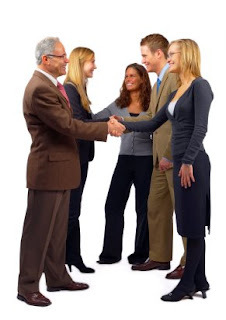 Read this great article about Four Ways to Be a Better Networker. After all, you can't grow your business if you don't get out of the office.